Malaria is one of the most serious diseases present on the globe today. Infecting over 200 million individuals annually, this mosquito-borne illness claimed over 400,000 lives in 2015 alone. The treatment of this disease has been radically improved in recent years since the introduction of artemisinin based therapies. 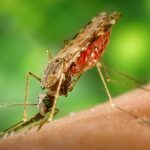 This medication is now suffering the fate of previous malaria treatments, however, as there are increasingly frequent reports of malaria becoming resistant to artemisinin. As has been widely published with antibiotics, there are bacteria which are now multi-resistant and against which we have few therapeutic choices: the same is becoming true of anti-malarial medication. Artemisinin has an extremely long heritage. If there is one medication to which the advocates of medicinal plants can point, it is to the sweet wormwood plant Artemesia annua from which artemisinin derives both its active ingredient and its name. The earliest report of this plant being used medicinally was written on a piece of silk discovered in the Mawangdui Han Dynasty tombs in 168 BC. Although initially used as a treatment for haemorrhoids, its potential as an anti-fever agent was later realised in the Handbook of Prescriptions for Emergency Treatments by Ge Hong, written in the Jin Dynasty between 283-343 AD. It is unclear whether the fever referred to in the text would have been caused by malaria, but there are reports that the use of sweet wormwood, or qinghao in Chinese, was extensively used to treat malaria in rural areas of China. By the 1960s the ability of artemisinin to combat malaria in rodents was formally recognised. In fact the Chinese scientists involved with this work were able to adapt the original recipe described by Ge Hong: ‘Take one bunch of qinghao, soak in two sheng of water, wring it out to obtain the juice, and ingest it in its entirety’, to prepare a medication that was 100% effective against rodent malaria. Modern pharmacology has been able to purify the medication, often combining it with other antimalarials to produce artemisinin combination therapies (ACT) that have been very effective in treating uncomplicated malaria, usually in just 3 days. As with chloroquine and Larium (mefloquine), there are increasing numbers of reports of malaria species becoming resistant to ACT, however. This has either taken the form of a patient failing to respond to ACT, or following treatment, a recurrence of malaria resulting. Such reports of resistance to ACT have often come from the border between Thailand and Cambodia. It is unknown at present why malaria in this region is developing resistance to ACT – although there are several theories. One such theory concerns the traditional use of sweet wormwood tea as a local cure for malaria. Although there are few data at present to support the theory, the WHO has suggested that taking sweet wormwood tea in rural areas may contribute to malaria becoming resistant to artemisinin. The reason for this is that in order to receive a therapeutic dose of artemisinin, an individual must consume a gallon of the curative tea – that is to say literally a gallon – 5L of tea daily and continue it for 7 days. The WHO state that most patients using this traditional therapy only manage around 1L a day, meaning that the individuals could well be under-dosed with the anti-malarial, allowing the malarial parasites to become resistant to it. A more generally accepted theory of resistance concerns the partial completion of treatment courses against malaria. Analogous to the advice that we receive about finishing antibiotic courses for a chest infection, if patients don’t complete courses of anti-malarial therapy, they run the risk of only partially treating the malaria, allowing the ‘naturally’ resistant forms of malaria to predominate. This is certainly a strong possibility. If artemisinin combinations were to be used prophylactically (to ward off a possible infection) along the Thai – Cambodian border, there would be the risk that individuals who would not take the medication properly could promote resistance to malaria should they become infected. In the first instance, most would question the utility of using ACT, a therapy that is reserved for treating malaria, as also a preventative therapy: if you developed malaria whilst using ACT, it may be unlikely to treat it effectively. For these reasons the general use of ACT as a prophylactic medication has not in fact occurred: but there have been 2 local trials that have attempted this. In 2011, one thousand individuals in Northwest Thailand were treated for 3 days a month (or every other month) with ACT during a study period of 9 months. The fact that 10% of the subjects did actually succumb to malaria during the test period must make us question not only if the medication was taken properly, but also whether the existence of ACT resistant species of malaria were facilitated by this trial. Another study involving ACT as a prophylactic medication was attempted in 2012, this time along the Thai-Cambodian border. This study was abandoned quite rapidly, however, as cardiac irregularities were noticed in some test subjects. Whether these studies did contribute to the malarial resistance to ACT in the region is unclear; whether they should have occurred at all is perhaps less debatable, however. As mentioned, there is an obvious link between bacterial antibiotic resistance, following both the over prescription and failure to finish courses of antibiotics, and malarial resistance to ACT, perhaps for similar reasons. One further link between these diseases has recently been postulated, resulting from an unexpected consequence of a more accurate diagnosis of malaria. Until the recent advent of simple finger-prick blood testing of malaria, afforded by the rapid diagnostic tests for malaria (RDT), when an individual presented with a fever in many tropical areas of globe, they would be treated for malaria. As the consequences of malaria can be so severe, and the old diagnostic test for malaria by using a ‘blood film’ was technically demanding and so often unreliable, malaria was well known to be over-diagnosed. The result was that many thousands of patients received antimalarials, but did not in fact have malaria. Such an over-prescription of antimalarials aided the formation of widespread resistance to older forms of malaria treatment. Following the advent of RDTs for malaria, medics in the most remote of settings could accurately diagnose malaria, thus limiting the inappropriate global circulation of antimalarials and the occurrence of resistance. A good thing for us you’d think. However, as the number of prescriptions for antimalarials has decreased, the number of patients subsequently being given antibiotics for their fever has vastly increased. In some studies almost all patients who had a negative malaria RDT were prescribed antibiotics. What has been an advance against global malaria resistance is proving to be a catalyst for bacterial resistance: roundabouts and swings of global significance.